Houston received an incredible 45 inches of rain in the first six months of 2004, nearly equaling the annual average of about 48 inches. 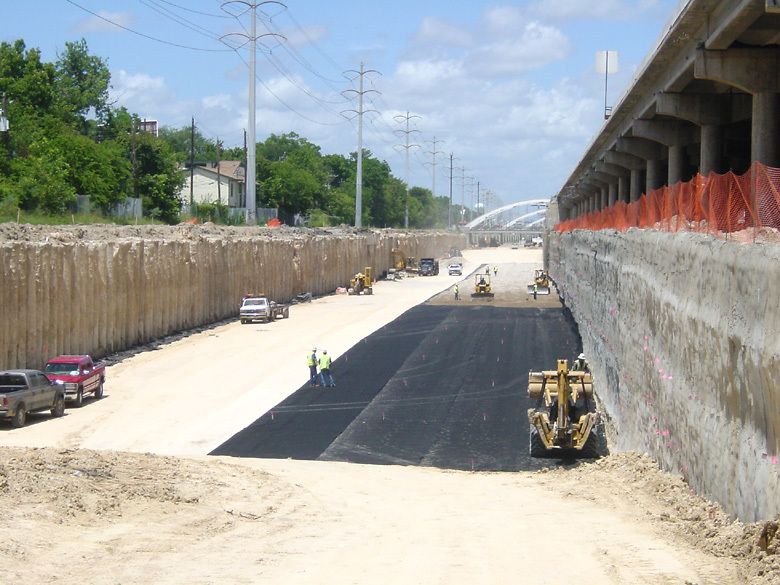 Of course this has slowed down construction, but work has still proceeded well on the Southwest Freeway trench excavation and the Fort Bend Parkway. 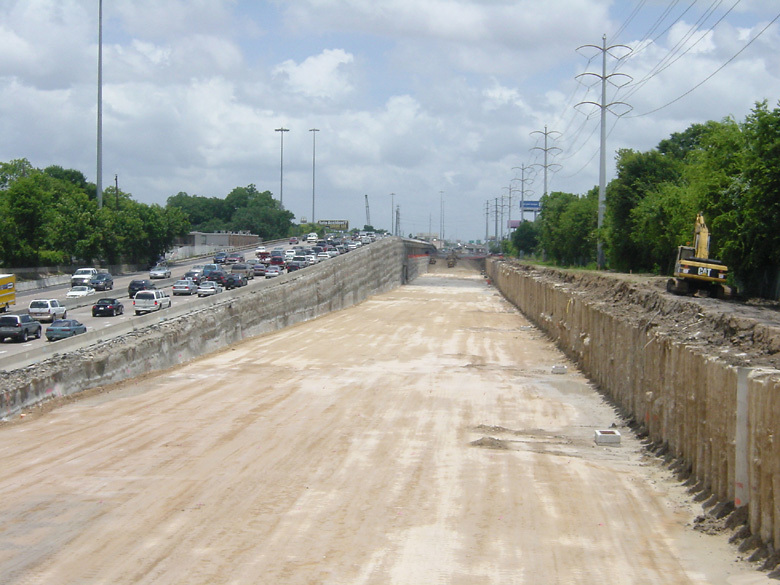 Work on the Katy Freeway is also proceeding well, although I don't have photos in this update. Work is proceeding quickly on the trench for the northbound main lanes. 12-June-2004. Looking west at Montrose into the newly excavated trench. 12-June-2004. Another view of the trench at Montrose. 12-June-2004. Looking east from the Mandel overpass. 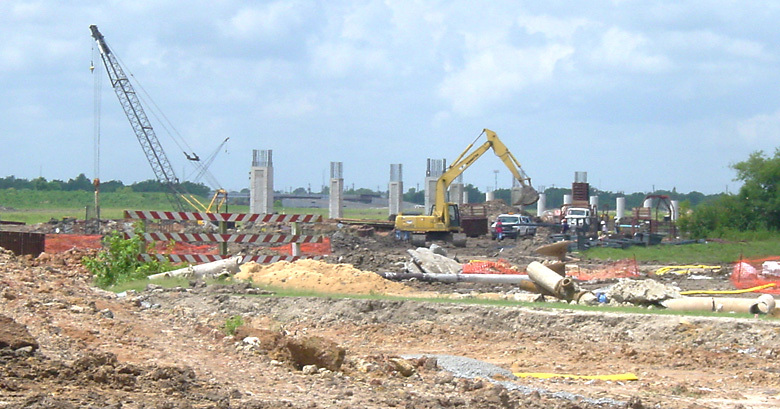 This project is about 70% complete as of July 2004. 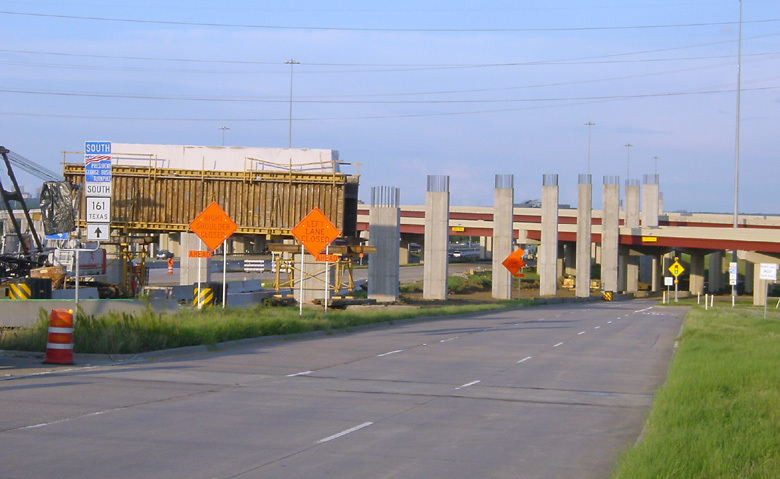 The highest ramp has its piers in place and bridge beams should be in place soon, if they aren't already in place as of July 4, 2004. 9-January-2004. Looking north at the ramp for westbound tollway to northbound SH 249. 9-January-2004. 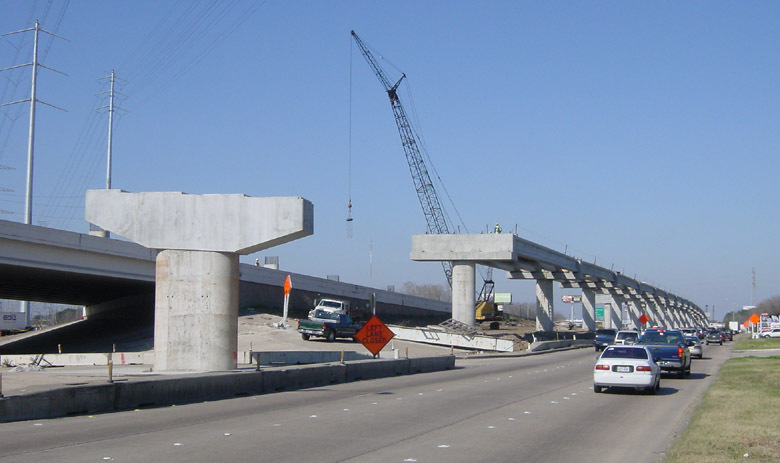 The eastbound tollway to northbound SH 249 will go underneath the tollway main lanes. 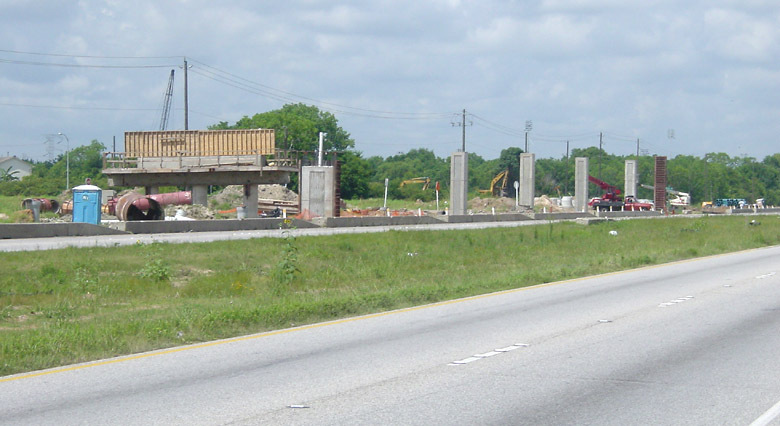 This photo shows how the tollway piers will need to be busted out to make way for the ramp. 10-June-2004. 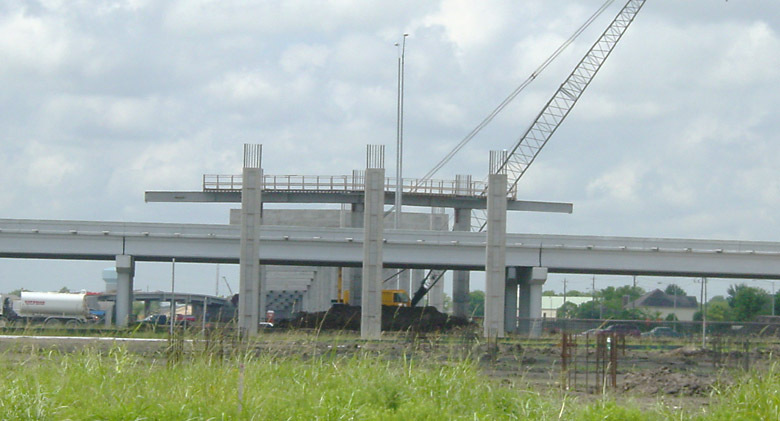 This driver's view eastbound on the tollway shows the piers for the high-level ramp that will connect southbound SH 249 to the eastbound tollway. In spite of the extremely heavy rain, the first section from SH 6 to BW 8 (Sam Houston Tollway) is scheduled to open Labor Day. These photos show the section north of BW 8, which will open later. 14-June-2004. 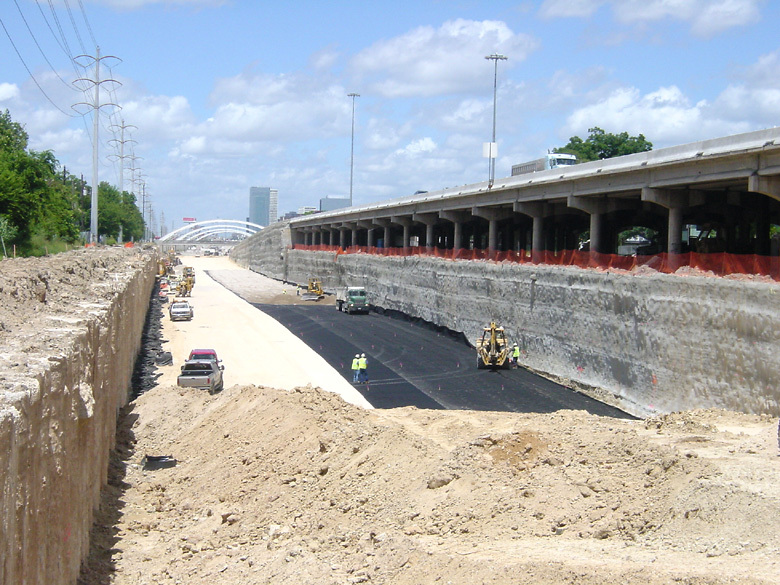 Looking west along US 90A at the direct connection ramp from the tollway. 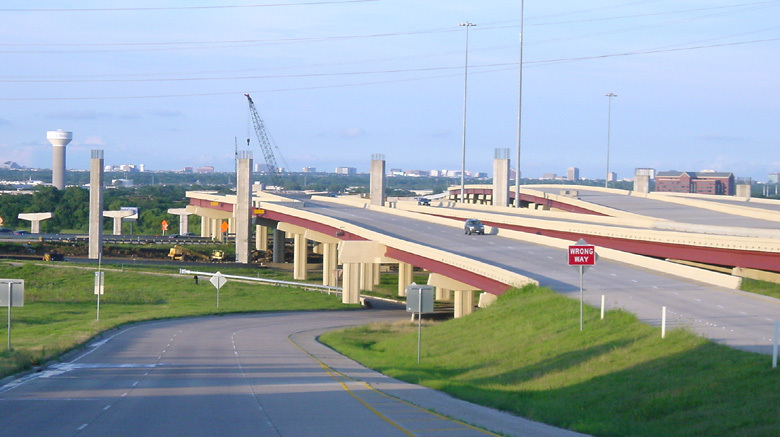 There will be another ramp for westbound US 90A traffic, as well an overpass for the tollway main lanes, making this an inpressive interchange for a US 90A, which is not a freeway. 14-June-2004. 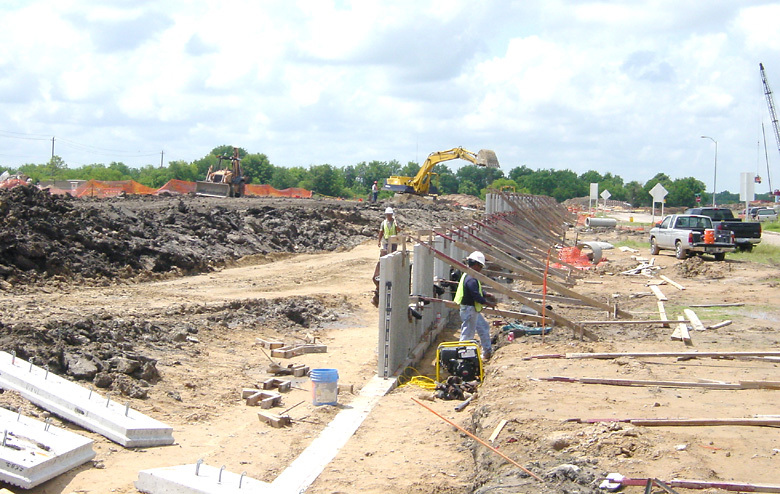 Construction of a retaining wall at Orem. 14-June-2004. South of Orem, showing piers for an elevated structure. 14-June-2004. 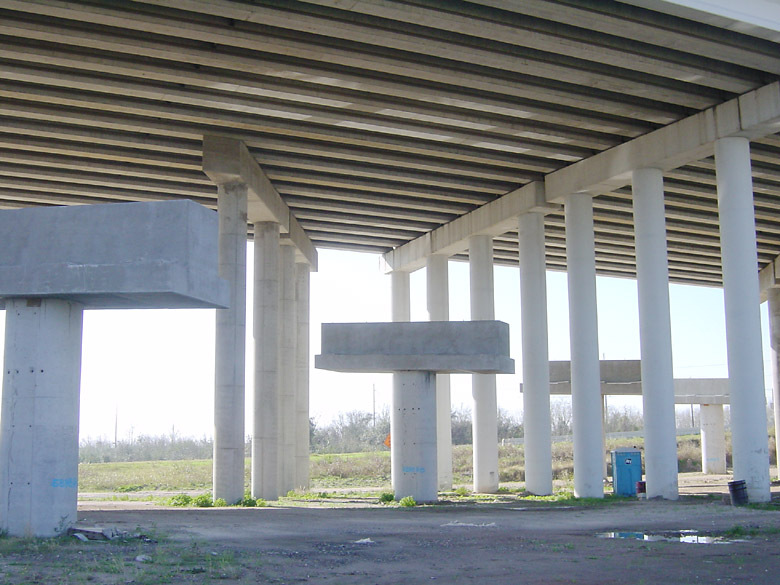 This shows the overpass structure at Beltway 8. Based on the latest info I heard, there will not be any direct connectors at this intersection at this time. In the future some connectors will likely be built as traffic volumes warrant. Section F-2 of the Grand Parkway (between I-45 north and SH 249 at Tomball) has generated substantial oppostion. The problem is that the area is urbanizing so quickly that the alignment that was selected 1-2 years ago is now being encroached upon by new neighborhoods, and these neighborhoods are now adopting NIMBY attitudes. A meeting in March or April of 2004 drew a large crowd which exceeded the capacity of the meeting venue, and the excluded people were upset. 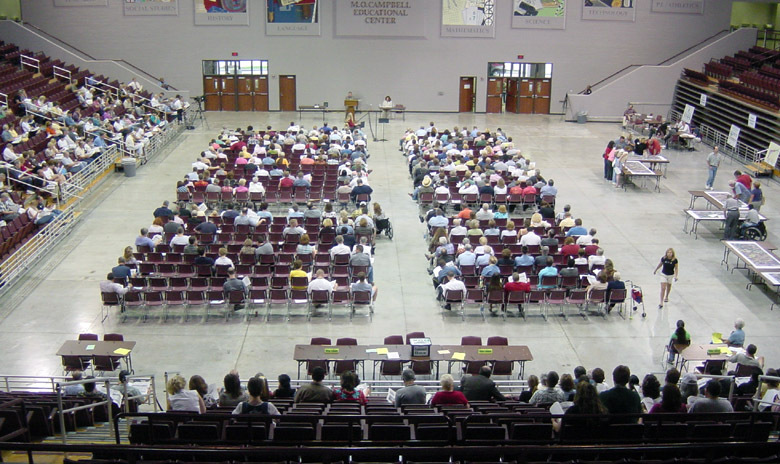 The June 2004 meeting was held in an arena stadium to ensure there was plenty of space. Observers who attended both meetings told me that the crowd in June was smaller than the previous meeting. The opposition was well organized with signs and beverages for their supporters. I couldn't stay for the public comment session, but I'm sure they singed the microphone. 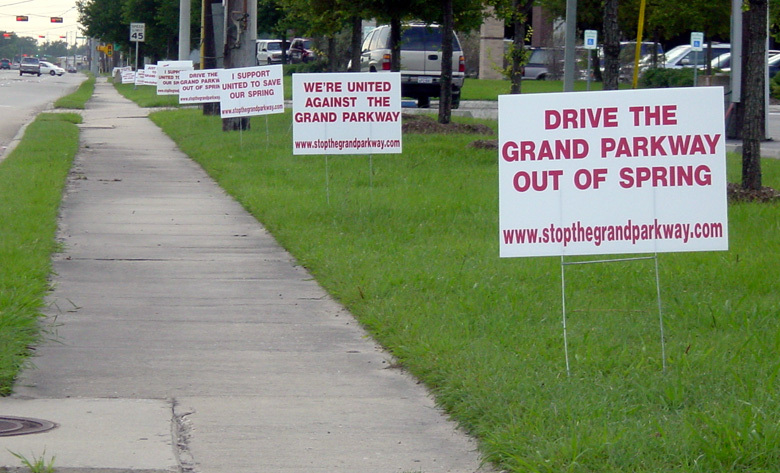 My opinion is that the opposition will not stop this section of the Grand Parkway. The alignment selection process has been ongoing for years, and it has appeared to follow the letter of the law, so I think a lawsuit will fail. Key political leaders are standing behind the Grand Parkway, including Harris County Judge Eckels and State Senator Jon Lindsay. 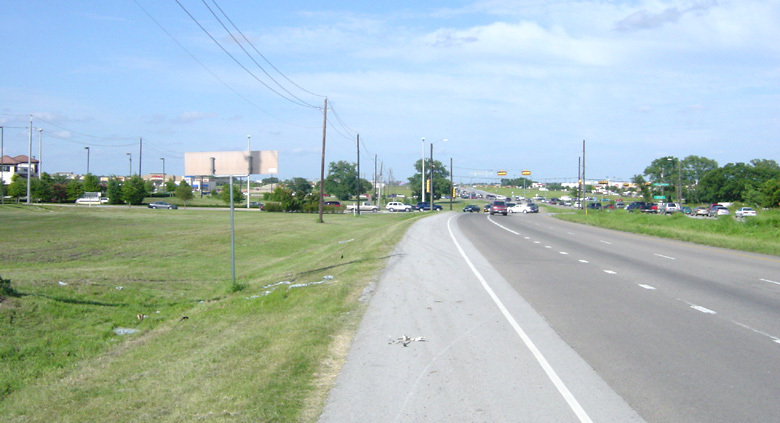 And the fact is, this section of the Grand Parkway is needed and will be critical in the future. We could see some tweaking of the alignment. If a lawsuit is filed, we could see a delay in the issuance of the ROD. 10-June-2004. The opposition placed signs outside the meeting hall. 10-June-2004. A view of the meeting hall. The floor seats were about 2/3 full, and there was some spillover into the stands. Prestonwood Town Center Mall was located along the North Dallas Tollway at the Belt Line intersection. In its heyday in the early 1980s, it was one of Dallas' most upscale shopping centers, including Neiman Marcus, Dillard's (then Joske's) and Lord & Taylor anchor stores. This is probably the newest, most modern shopping mall to be demolished in the United States. (If you know otherwise, drop me an email at author@houstonfreeways.com.) Below is a history of the mall from the Dallas Morning News. August 1979: Prestonwood Town Center opens with anchor stores such as Neiman Marcus, Lord & Taylor, J.C. Penney and Montgomery Ward. It features the latest in mall amenities, including an ice-skating rink, glass vaulted roof and huge center court. April 1985: Mervyn's replaces Montgomery Ward. June 1990: Claritis, which sells demographic information to marketers, says the ZIP code surrounding Prestonwood is the second-wealthiest in Dallas. April 1996: Prestonwood's owner announces a $125 million renovation to create a "fashion quarter," "courthouse square" and entertainment complex. AMC Theaters says it intends to build a 24-screen movie house. The projects never occur. September 1997: J.C. Penney announces it is pulling out; Mervyn's shuts its doors. 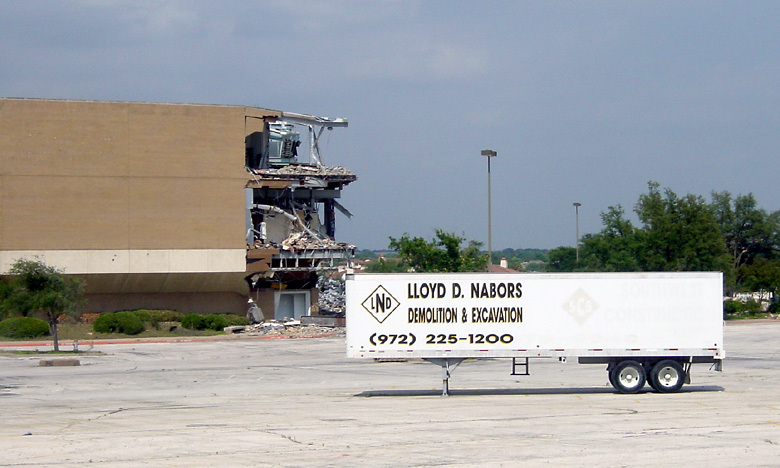 October 1997: Neiman Marcus announces it is leaving for a mall in Plano but will stay until the new mall is completed in 2001. July 1999: Neiman Marcus and Lord & Taylor are the only two tenants left; the rest of the mall was closed months ago. November 2000: A new owner, Archon Group, unveils plans to convert the mostly vacant Prestonwood into a telecommunications and computer complex called Genisus Dallas North. August 2001: Plano's Shops at Willow Bend opens with part of the same lineup that once graced Prestonwood, including Lord & Taylor and Neiman Marcus. October 2003: After more than two years of a high-tech and telecom tailspin, Archon announces it is rethinking uses for Prestonwood. 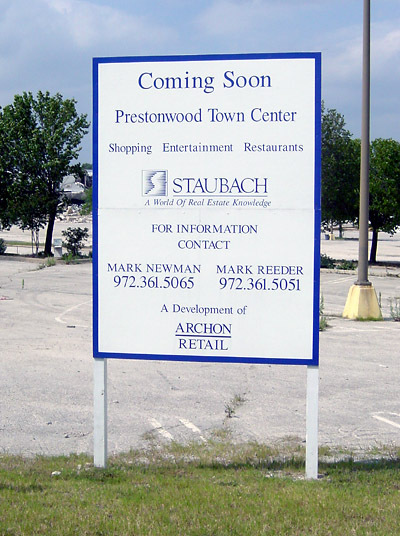 February 2004: Owners begin to replace Prestonwood with a smaller, open-air shopping center. Real estate brokers say a Wal-Mart Supercenter is earmarked for a site at the north end of the project near Arapaho Road. 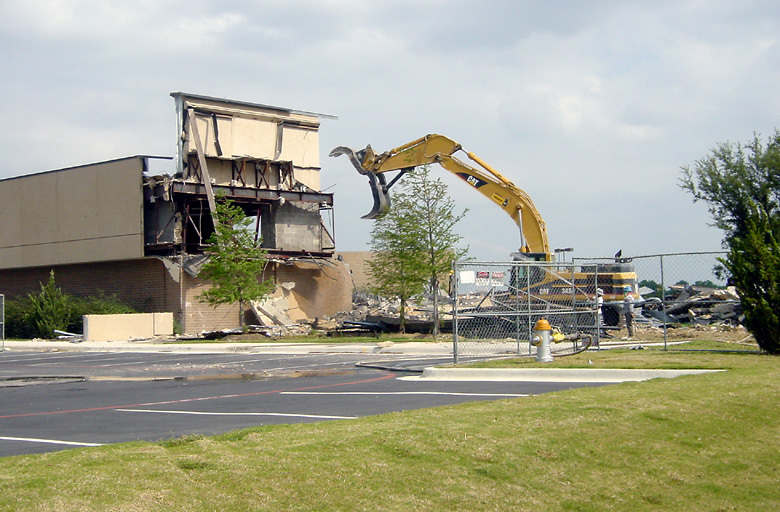 By June 2004 PrestonWood Town Center was gone. Controversy was swirling over plans for a Wal-Mart Supercenter on the property. 26-May-2004. This view shows the structure of the one of the anchor retailers, Neiman Marcus. 26-May-2004. The clamp device on the excavator-crawler was tearing apart the structure near Montfort Road. This wing of the mall connected to a J.C. Penney anchor store which was previously demolished. 26-May-2004. The main mall section was in ruins. 26-May-2004. 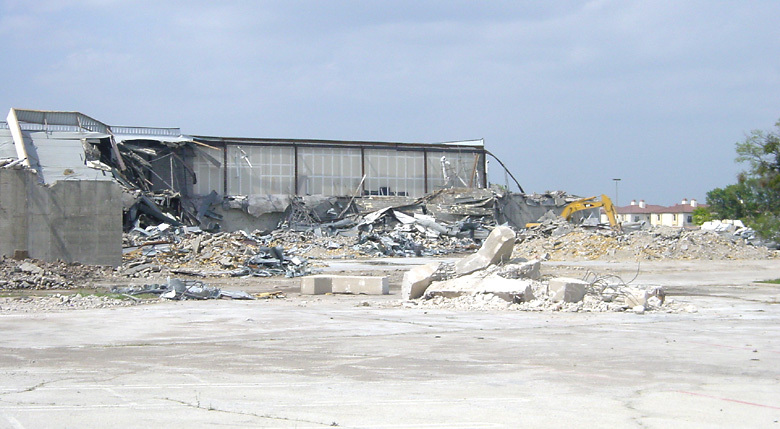 The influential Staubach real estate firm has a hand in the redevelopment. The interchange is complete except for two direct connection ramps which are under construction. One of the new ramps will be the highest at the interchange. This interchange will be fully operational when the SH 190 extension opens, probably in about a year. 27-June-2004. Looking east along IH-635 at the piers for the ramp connection eastbound IH-635 to northbound SH 190. 27-June-2004. 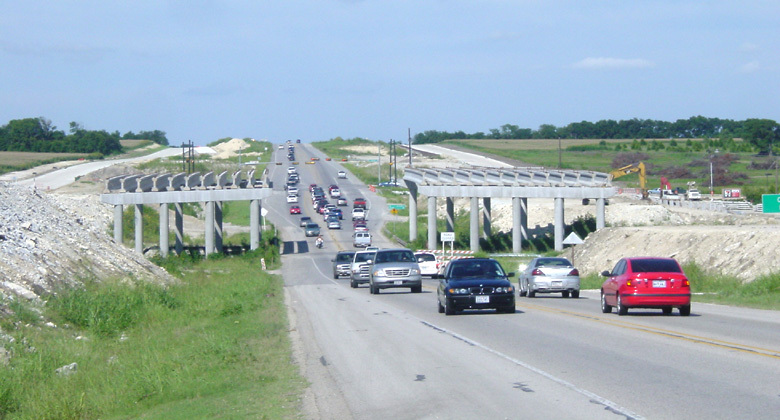 Looking north along SH 161-toll. 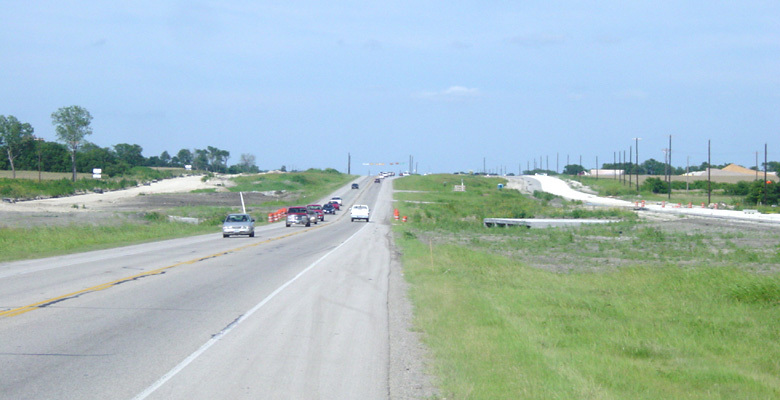 North of IH-635, this route become SH 190. 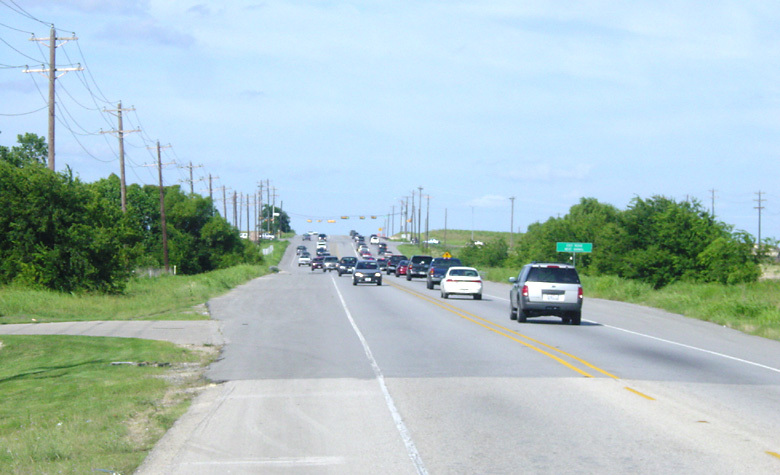 A $75 million contract to build the frontage roads and main lanes will be awarded in July 2004. So this is the last look at the old blacktop before it goes away. Don't be deceived by the rural landscape adjacent to the road. There is heavy urbanization all around. Further west, new frontage roads are nearly complete. These photos start at Preston Road and proceed eastward. 5-July-2004. At Preston. The land to the left is freeway right-of-way. 5-July-2004. At Coit, looking east. 5-July-2004. Just west of Custer, an active project to build the frontage road begins. 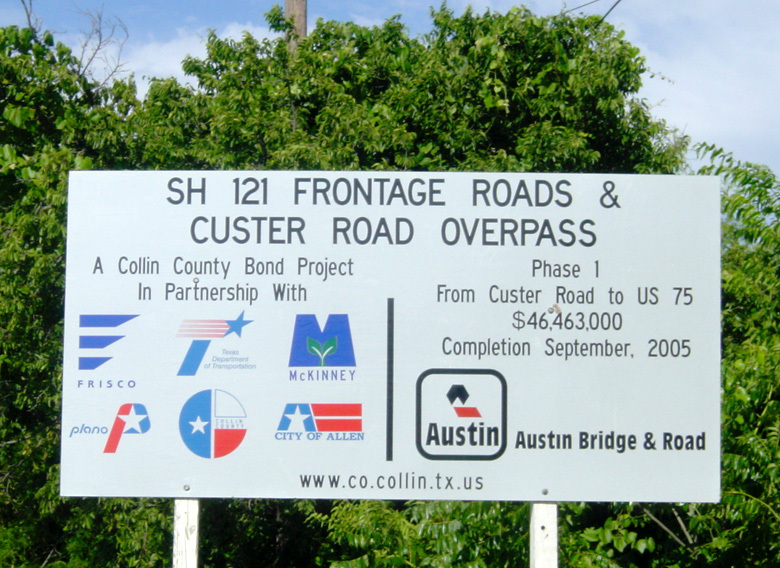 I don't ever remember seeing this project on the TxDOT letting schedule. It appears to be a locally funded project. 5-July-2004. At Custer. 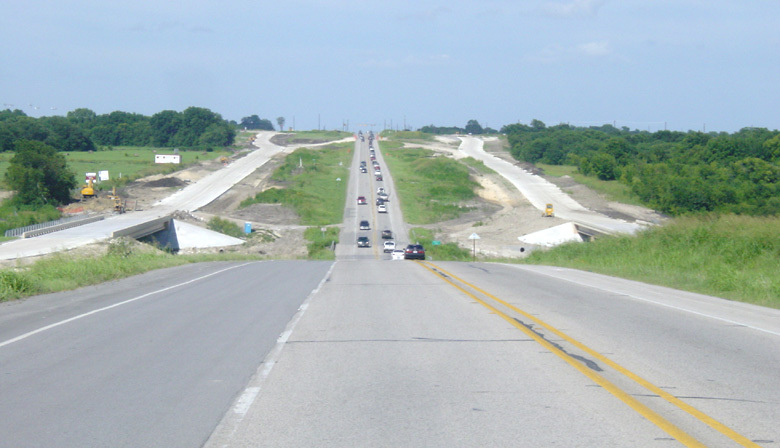 The freeway main lanes are included in this phase of the project. 5-July-2004. Another view at Custer. 5-July-2004. East of Custer, the frontage roads are nearly complete.